Sosai (President) Masutatsu Oyama, the founder of Kyokushin Karate, was born in southern Korea in 1923. While living at his sister's farm in Manchuria at the age of nine, he began his lifelong journey along the Martial Way when he began studying the southern Chinese form of kempo know as "Eighteen Hands". When Mas Oyama returned to Korea at the age of 12, he continued his training in Korean kempo. In 1937, Mas Oyama moved to Japan to attend a youth military academy. He began studying Shotokan Karate and after two years moved to Tokyo where he enrolled in Takushoku University and was accepted to train at Gichin Funakoshi's private dojo. Oyama studied under Funakoshi every day for two years and at 18 was drafted into the imperial army. He joined the Butokukai in which he was a member of the Kihokai, a section which taught espionage and guerilla tactics during the war. Following the second world war, Oyama trained with So Nei Chu, a Korean Master of Goju-Ryu Karate. This great teacher, renowned for the power of his body, and deep spiritual inclination had a profound influence on young Mas Oyama. Master So taught him the inseparability of budo and the spiritual fundamentals of Buddhism. Master So advised Mas Oyama to make a firm commitment to dedicate his life to the Martial Way and retreat to a mountain hideout (at Mt Kiyosumi) and train his mind and body, which Oyama did. After 18 months of seclusion, Mas Oyama returned to civilization. He began his famous battles with bulls; partly to test his strength and also to make the world sit up and notice the power of his karate. 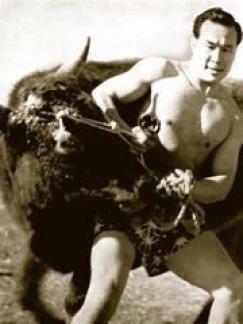 All together, Oyama fought 52 bulls, killing 3 instantly and taking the horns of 36 with knife-hand blows. Mas Oyama opened his first "Dojo" in Mejiro, Tokyo. This was the time that Mas Oyama's karate strength was at its peak so the training was severe. Many students were members of other styles and Mas Oyama would compare styles and build on his karate. He would take what he felt were the best techniques and concepts from any Martial Art and gradually fit them into his training; therefore, laying the foundations of Kyokushin Karate. The first "School of Oyama" outside Japan was opened by Shihan Bobby Lowe in Hawaii. In 1952, Mas Oyama gave his first demonstration in Hawaii. After the demonstration Shihan Bobby Lowe met Mas Oyama and arranged to train with him. Bobby Lowe's father was an instructor of Kung Fu so he had done much training in the Chinese Martial Arts and various other arts. However Mas Oyama's powerful demonstration had so stunned him that Bobby Lowe began to train with Mas Oyama. Since its official inception, Kyokushin Karate has spread to more than 120 countries, with more than twelve million practitioners, making it one of the largest martial arts styles in the world. Sadly, Mas Oyama (a non-smoker) died of lung cancer in 1994 at Tokyo. His unexpected death left his organization in a very confused state. This has resulted in a splintering of the IKO into a number of groups, each of which claims to be the true successor to Mas Oyama's organization.